The following explanation of the recent seismicity on Dominica (BGVN 23:11) was provided by John Shepherd of the Seismic Research Unit. "There has indeed been a series of earthquakes in Dominica, West Indies, over the past few months. The sequence reached an apparent climax on 22-23 October 1998 when a total of about 370 earthquakes occurred, of which over 100 were felt. Since then earthquake numbers have declined irregularly with smaller maxima in numbers on 6 and 30 December 1998. At the present time (5 February 1999) the rate of activity has declined to a few earthquakes per week, which is about the background level which we have observed for the past 30 years. "The earthquakes are part of a pattern which has continued for at least 250 years. The present earthquakes are NOT directly associated with Morne Patates or any other volcano in Dominica and there have been absolutely no other signs of volcanic activity. 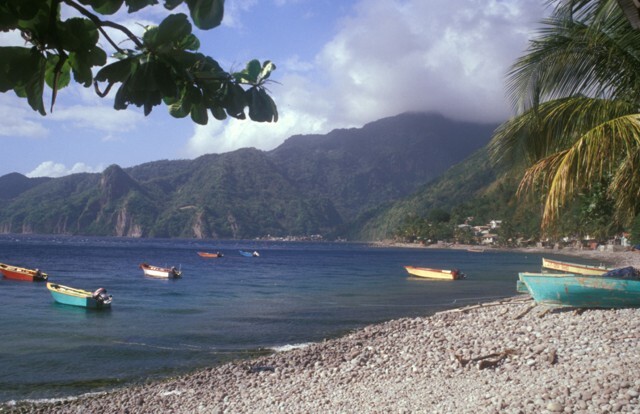 Dominica is in the center of the tectonically-active Lesser Antilles, and non-volcanic earthquakes are frequent. Dominicans refer to felt earthquakes as 'tremors.' This has no scientific significance; the earthquakes are conventional local earthquakes and no volcanic tremor has been recorded. "There is undoubtedly a continuous volcanic hazard and many Dominicans have become concerned because this particular set of earthquakes follows closely on the recent events in the nearby island of Montserrat. For this reason the government of the Commonwealth of Dominica has conducted an intensive program of public awareness in which we have participated. We are also assisting in the preparation of an updated volcanic hazards map for Dominica." Information Contacts: John B. Shepherd, Head of Seismic Research, The University of the West Indies, St. Augustine, Trinidad. The Global Volcanism Program has no Weekly Reports available for Morne Plat Pays. Four swarms of felt earthquakes centered near Morne Patates . . . have occurred since March (table 1). Activity typically consisted of 10-30 recorded A-type volcanic shocks in a roughly two-hour period, about half of them felt by residents of flank villages. The most recent swarm occurred on 29 October (after 10 days of quiet) when 26 earthquakes were felt between 0000 and 0200. As of 12 November, no new swarms had been recorded. Table 1. 1986 earthquake swarms at Morne Patates, recorded by three telemetered seismometers on Dominica and 15 others within 100 km of the island. Three telemetered seismometers on Dominica and 15 others within 100 km recorded the events. Precise depth and magnitude determinations were difficult, but the events were shallow, perhaps at ~3 km depth, and the largest had duration magnitudes of 3-3.5. Instruments were able to detect events of about M 2 or larger. Geologists visited the area in early November and installed four additional seismic instruments in the epicentral area; data will be telemetered to Trinidad. Fumaroles in the crater and on the N flank appeared unchanged and no other surface changes were evident. Information Contacts: J. Shepherd, UWI; C. Antenor-Habezac, Observatoire Volcanologique de la Soufriere, Guadeloupe. A fire of unknown origin burned 10 m2 of accumulated sulfur deposits in the Soufriere Sulphur Springs area (~700 m SSW of the summit), causing false eruption reports. The alleged eruption was reported by residents to have started on 24 April with the formation of small lava flows. Authorities in the capital of Roseau passed the information to the Seismic Research Unit in Trinidad. A team was sent to investigate the report on 27 April. No local seismic activity was detected at the permanent seismographic station, located 1.5 km away, or by the portable seismometer installed at the site during the visit. Information Contacts: W. Ambeh, L. Lynch, and R. Robertson, UWI. According to reports from local news sources and USAID's Office of Foreign Disaster Assistance (OFDA), earthquake swarms began on the island of Dominica on 11 September and continued intermittently into October. The Seismic Research Unit (SRU) of the University of the West Indies started monitoring the activity on 28 September and determined that [seismicity] was occurring in the S part of the island beneath Morne Patates volcano. By 23 October the [seismicity] had subsided to about two [earthquake] events per hour, with 10% large enough to be felt. An earthquake recorded by SRU at 1018 on 24 September had its epicenter at 15.28°N, 61.37°W. It occurred at a depth of 15 km with a body-wave magnitude of 2.9 and a Richter magnitude of 1 to 3. A spasmodic (new events were starting before the previous were finished) sequence of activity started about 1500 on 22 October. These events were less than 6 km deep and had a maximum magnitude of 3.5 Richter and an intensity of MM V. On 23 October, an SRU aerial reconnaissance revealed no surface manifestations of the events (i.e., scarps, vents). The strong [felt earthquakes] on 22-23 October were described as the longest and most intense in recent times. These [earthquakes] caused landslides and road closures, including the main road from the capital, Roseau, to the communities on the S end of the island. The SRU stated on 22 October that 27 was the maximum number of [events] recorded within a 24-hour period since 28 September, noting that the daily numbers were not as high as during the 1974 sequence. 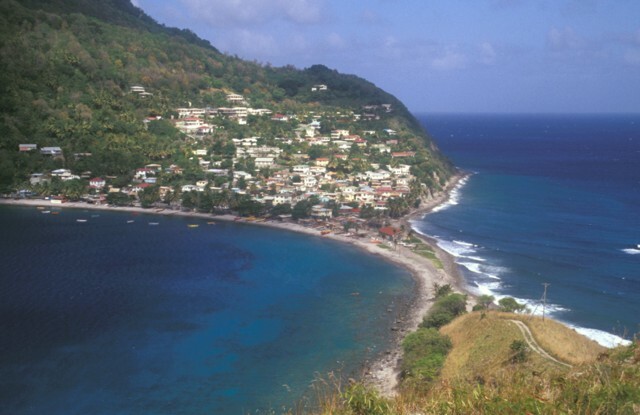 Morne Patates, at the southern tip of Dominica, is an arcuate structure open to Soufriere Bay on the west. It was constructed within an irregular depression on the SW flank of a larger stratovolcano, Morne Plat Pays, whose summit is only 3 km NE. The latest eruptions occurred at about 450 ± 90 years BP (Roobol and others, 1983) from the Morne Patates lava dome just prior to European settlement. At least ten swarms of small-magnitude earthquakes have occurred since 1765. The most recent swarm, between March and October 1986, consisted of 10-30 recorded A-type volcanic shocks in about two hours. No eruptive activity followed any of these swarms and no systematic shallowing was documented to indicate upward migration of magma. General References. Roobol, M.J., Wright, J.V., and Smith, A.L., 1983, Calderas or gravity-slide structures in the Lesser Antilles Island Arc? : JVGR, v. 19, p. 121-134. Information Contacts: Tina Neal, OFDA/USAID, 1300 Pennsylvania Ave. NW, Washington, DC 20523-8602 (URL: http://www.info.usaid.gov/ofda/ofda.htm); CaKaFete News, 25-12 Street, Canefield, Dominica (URL: http://www.cakafete.com/). The Morne Plat Pays volcanic complex occupies the southern tip of the island of Dominica and has been active throughout the Holocene. An arcuate caldera that formed about 39,000 years ago as a result of a major explosive eruption and flank collapse is open to Soufrière Bay on the west. This depression cuts the SW side of Morne Plat Pays stratovolcano and extends to the southern tip of Dominica. At least a dozen small post-caldera lava domes were emplaced within and outside this depression, including one submarine dome south of Scotts Head. The latest dated eruptions occurred from the Morne Patates lava dome about 1270 CE, although younger deposits have not yet been dated. 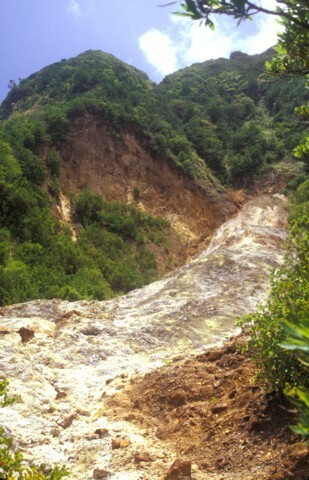 The Morne Plat Pays complex is the site of extensive fumarolic activity, and at least ten swarms of small-magnitude earthquakes, none associated with eruptive activity, have occurred since 1765 at Morne Patates. Halama R, Boudon G, Villemant B, Joron J-L, Le Friant A, Komorowski J-C, 2006. Pre-eruptive crystallization conditions of mafic and silicic magmas at the Plat Pays volcanic complex, Dominica (Lesser Antilles). J. Volcanol. Geotherm. Res., 153: 200-220. Lindsay J M, Stasiuk M V, Shepherd J B, 2003. Geological history and potential hazards of the late-Pleistocene to Recent Plat Pays volcanic complex, Dominica, Lesser Antilles. Bull Volcanol, 65: 201-220. Lindsay J M, Trumbull R B, Siebel W, 2005. Geochemistry and petrogenesis of late Pleistocene to Recent volcanism in southern Dominica, Lesser Antilles. J. Volcanol. Geotherm. Res., 148: 253-294. Roobol M J, Wright J V, Smith A L, 1983. Calderas of gravity-slide structures in the Lesser Antilles Island Arc?. J. Volcanol. Geotherm. Res., 19: 121-134. Samper A, Quidelleur X, Boudon G, Le Friant A, Komorowski J C, 2008. Radiometric dating of three large volume flank collapses in the Lesser Antilles arc. J. Volcanol. Geotherm. Res., 176: 485-492. Seismic Research Unit, 2001. Seismo-volcanic activity in Dominica (updated July 11, 2001). Seismic Res Unit, Univ West Indies (http://www.uwiseismic.com/dominica.html). Wadge G, 1985. Morne Patates volcano, southern Dominica, Lesser Antilles. Geol Mag, 122: 253-260. 0430 BCE (?) Unknown Confirmed Radiocarbon (uncorrected) Morne Patates ? There is no Deformation History data available for Morne Plat Pays. There is no Emissions History data available for Morne Plat Pays. The cloud-capped summit of Morne Plat Pays stratovolcano lies on the horizon near the southern tip of the island of Dominica beyond the sprawling capital city of Roseau. Three post-caldera lava domes (left-center to right) were formed north of a large arcuate depression open to the west that formed about 39,000 years ago. 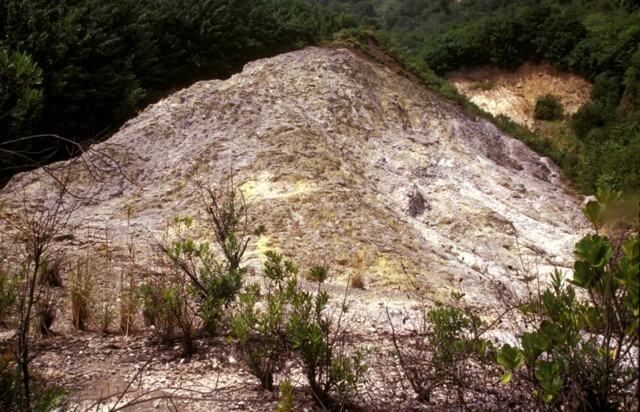 The latest dated eruption at the Morne Plat Pays volcanic complex occurred from the Morne Patates lava dome about 1270 CE, although younger deposits have not yet been dated. The 4-km-wide caldera of the Morne Plat Pays volcanic complex is widely breached to the sea of the west in this view from Scotts Head lava dome. It formed about 39,000 years ago following a major plinian explosive eruption and flank collapse that truncated Morne Plat Pays stratovolcano, the peak on the left-center horizon. 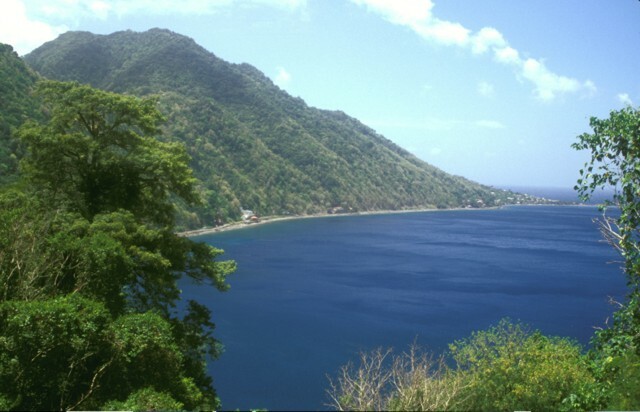 The northern caldera margin lies immediately north of the post-caldera Socrière lava dome at the far left and near Soufrière village at the far right. Post-caldera lava domes form the center-to-right horizon. Photo by Jan Lindsay, 2000 (Seismic Research Unit, University of West Indies). The Plat Pays volcanic complex rises to the south beyond the shoreline of the city of Roseau in the foreground. Three lava domes that formed after the roughly 39,000-year-old caldera collapse at Plat Pays lie on the horizon. On the left is the rounded Morne Canot dome, in the center is La Falaise dome, and the peak at the far right is Morne la Vue, which rises above the village of Pointe Michel. The summit of the Morne Plat Pays stratovolcano lies in the left-center background between Morne Canot and La Falaise domes. 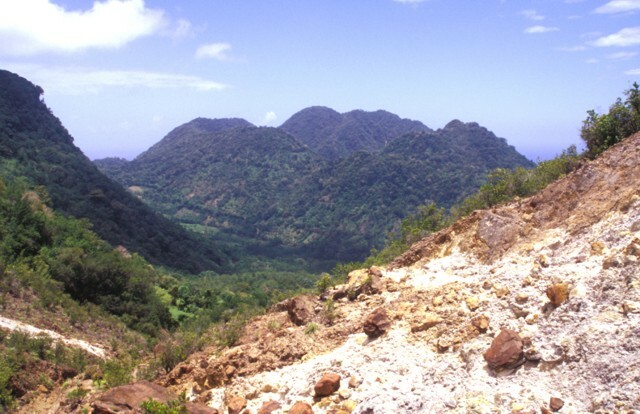 Volcano eco-tourism is a major component of the economy of the island of Dominica. 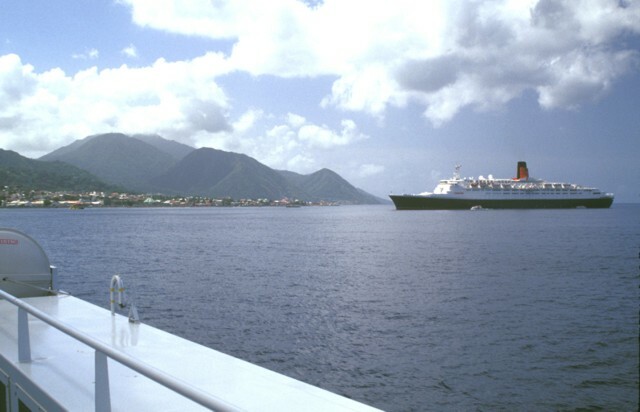 The cruise ship Queen Elizabeth II anchors in Roseau harbor with Morne Plat Pays volcano in the background. The Valley of Desolation thermal area is a popular destination for island visitors. Scotts Head lava dome forms a dramatic promontory marking the southern margin of Soufrière Bay and is connected by a narrow spit only a few meters high to Scotts Head village (left-center). The weathered hill (also known as Pointe Cachacrou) consists of subvertical lava sheets and is a remnant of lava dome extruded along a fracture inboard of the southern margin of the Soufrière Bay depression. The slopes of Crabier lava dome rise at the left. 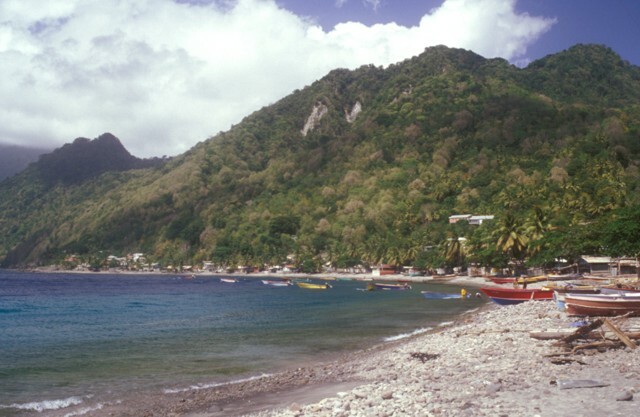 The Crabier lava dome rises about 500 m above the western shores of Soufrière Bay, with Scotts Head village at the far right. The dome is one of the youngest post-caldera features of the Morne Plat Pays volcanic complex. The Galion thermal area lies in the saddle (upper left) between Crabier and the Morne Patates lava dome. The upper Sulphur Springs geothermal area cuts the SW flank of Morne Plat Pays stratovolcano and lies just inside the large scarp formed by collapse of the edifice. The thermal area consists of steaming, hydrothermally altered ground with yellowish area marking many sulfur-encrusted fumaroles with temperatures of from 90-100 degrees Centigrade measured during the past century. Minor hot springs are also present. 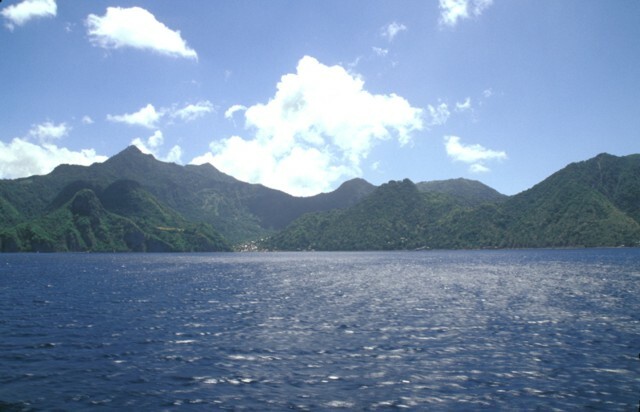 The Morne Patates (far left) and Crabier (right) lava domes, the youngest features of the Morne Plat Pays volcanic complex, rise above Scotts Head village on the southern tip of Dominica. The youngest dated eruption from Morne Patates took place about 685 years Before Present (BP) and produced block and ash flow deposits. Similar deposits were dated at about 1560 yrs BP, and an airfall deposit dated at about 2380 yrs BP also originated from this group of young lava domes. 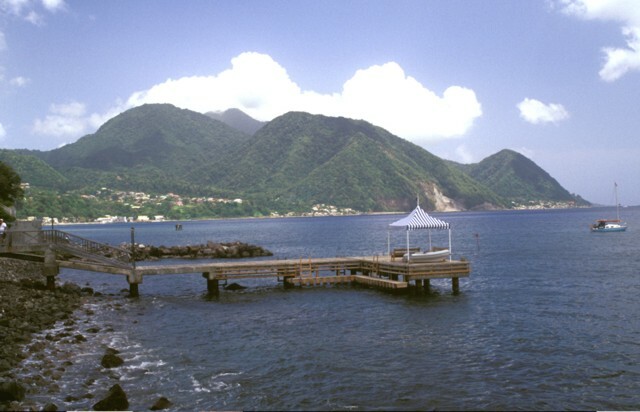 A narrow sand-and-gravel bar connects the picturesque fishing village of Scotts Head, the southernmost on Dominica, to the Scotts Head lava dome. The village, also known as Cachacrou, overlies volcaniclastic deposits on the SW flank of Crabier lava dome, a post-caldera dome near the southern rim of the Morne Plat Pays caldera. The summit of the steep-sided Sorcière lava dome rises from the coast at the left to just above the horizon. 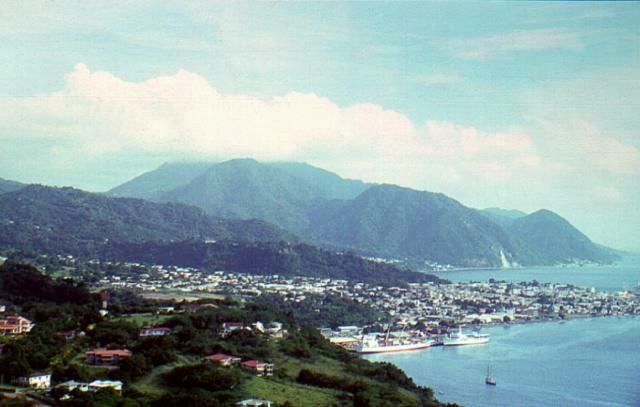 Morne Acouma lava dome (left-center) lies to the right of Sorcière in this view from Soufrière harbor (south of the domes) and was the source of a lava flow that extends to the northern edge of the town. Coastal cliffs below the domes consist of block and ash flow deposits associated with growth of the domes. The dacitic Morne Acouma dome is older than about 28,500 years. 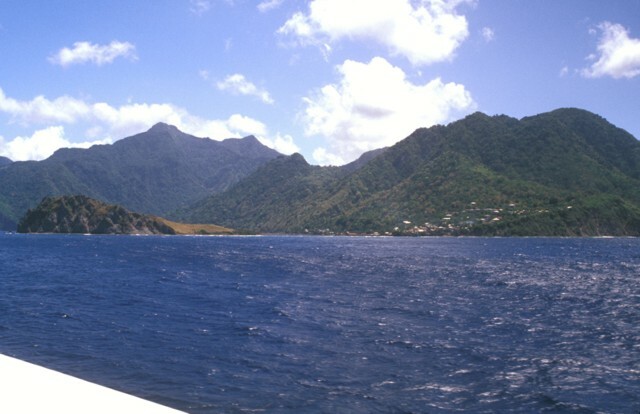 Scotts Head lava dome (left foreground) forms a narrow peninsula extending from the village of Scotts Head (right) on the southern tip of Dominica. A submarine lava dome, named Mountain Top, is thought to be less than 9000 years old and rises to within 30 m of the sea surface about a kilometer south of Scotts Head dome. The peak on the left horizon is Morne Play Pays stratovolcano; the post-caldera lava domes of Morne Patates, Crabier, and Morne Rouge form the center-to-right horizon. Morne Plat Pays (left), Morne Patates (right-center) and Crabier (right) at the SW tip of Dominica are seen from the SW. The Morne Plat Pays volcanic complex contains the Morne Plat Pays stratovolcano and a complex of central lava domes. The complex is cut by a large depression, partly filled by the lava domes, that was formed by collapse of the volcano during the late Pleistocene. The collapse scarp is 400-900 m high, and submarine debris-avalanche blocks from the collapse are visible in bathymetry. The youngest cluster of lava domes of the Morne Plat Pays volcanic complex, Morne Rouge, Crabier, and Morne Patates (left to right) is seen here from the north at the upper Sulfur Springs thermal area. The cliff in the shadow at the left is the west-facing wall of the arcuate Morne Plat Pays caldera, which formed about 39,000 years ago in association with the eruption of the Grand Bay Ignimbrite and a lateral flank collapse to the west. The Sulfur Springs thermal area was the site of combustion and melting of sulfur deposits in 1994 that produced a sulfur flow over an area of about 1 sq km, prompting reports of a volcanic eruption. Measured fumarole temperatures at Sulfur Springs have ranged between about 90 and 100 degrees Centigrade over the past century. 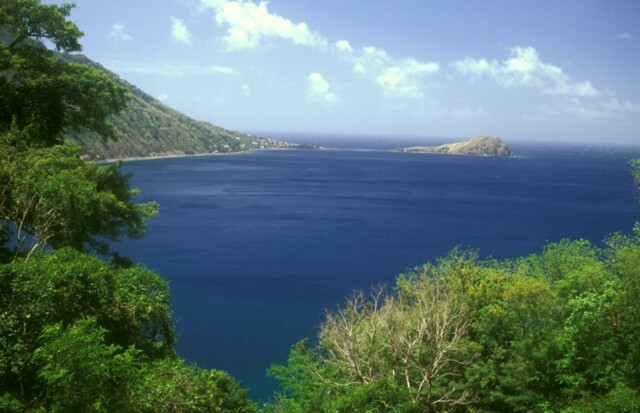 The promontory at Scotts Head provides a vantage point overlooking the partially submerged Plat Pays caldera, widely breached to the west at Soufrière Bay. The caldera, which partially truncated Morne Plat Pays stratovolcano (in the clouds on the center horizon) formed about 39,000 years ago. Its margins extend from north of Sorcière lava dome (far left) to near Scotts Head. 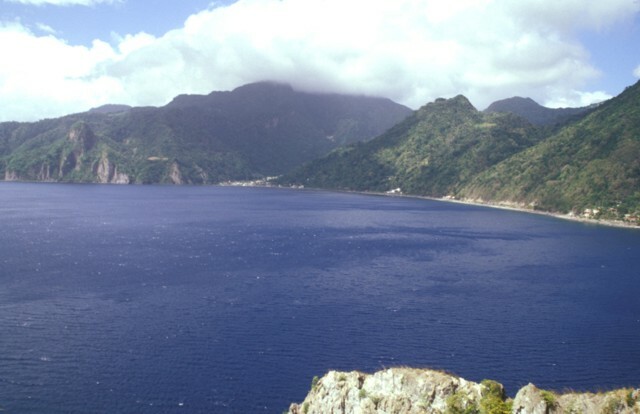 Morne Patates, the dome along the coast at the right-center, is the youngest post-caldera lava dome and was active until at least about 700 years ago. The Global Volcanism Program has no maps available for Morne Plat Pays. There are no samples for Morne Plat Pays in the Smithsonian's NMNH Department of Mineral Sciences Rock and Ore collection. Large Eruptions of Morne Plat Pays Information about large Quaternary eruptions (VEI >= 4) is cataloged in the Large Magnitude Explosive Volcanic Eruptions (LaMEVE) database of the Volcano Global Risk Identification and Analysis Project (VOGRIPA).